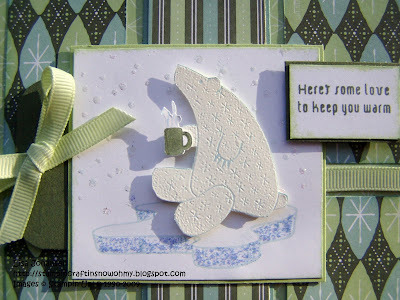 This is my 2nd catch-up card for Holly's Sunday Stamps challenge. This time its the letter 'C' and she said to make something using car stamps, or use a set that begins with 'C'. Once again I went ahead with a stamp set and used one from the current SU Holiday Mini Catalog. Its called Cold and Cuddly and the minute I saw the penguin in the set I knew I had to have it. However, hes not the image I used today :) The layout is from this weeks challenge over at Mojo Monday. The only thing from the layout I changed was the 2nd square image, which I made a small rectangle for my setiment. 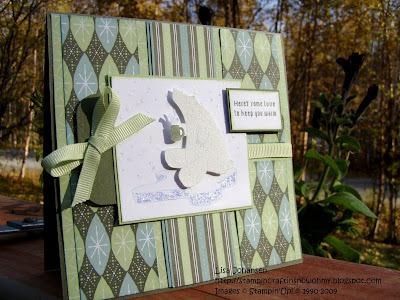 The polar bear was embossed in white and I brushed Soft Sky across him to bring out the details a bit more. I then put some stickles along the edges of the ice, to make it sparkle a bit like the edges of ice tend to do. 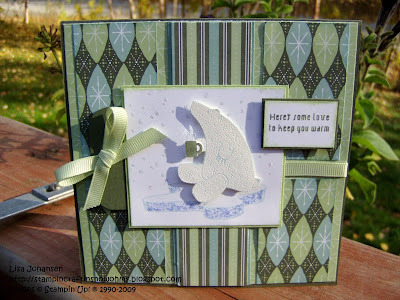 I also heat embossed snowflakes around the polar bear. Fun flock? I love that stuff and have a big jar of it! Your card is beautiful! I just love the polar bear!